Epictetus (55 A.D.-135 A.D.) was born a slave and became one of the great philosophers of Rome. 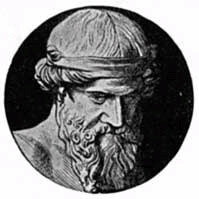 He was expelled from the city in 94 A.D. and it was while in exile that he came up with a way of teaching his followers. Here is an extract from his Art of Living. ‘Two things may happen when we meet someone: either we become friends or we try to convince that person to accept our beliefs. The same thing happens when a hot coal meets another piece of coal: it either shares its fire with it or is overwhelmed by the other’s size and is extinguished. But, since, generally speaking, we feel insecure when we first meet someone, we are more likely to affect indifference, arrogance or excessive humility. The result is that we cease being who we are, and matters move into a strange world that does not belong to us.